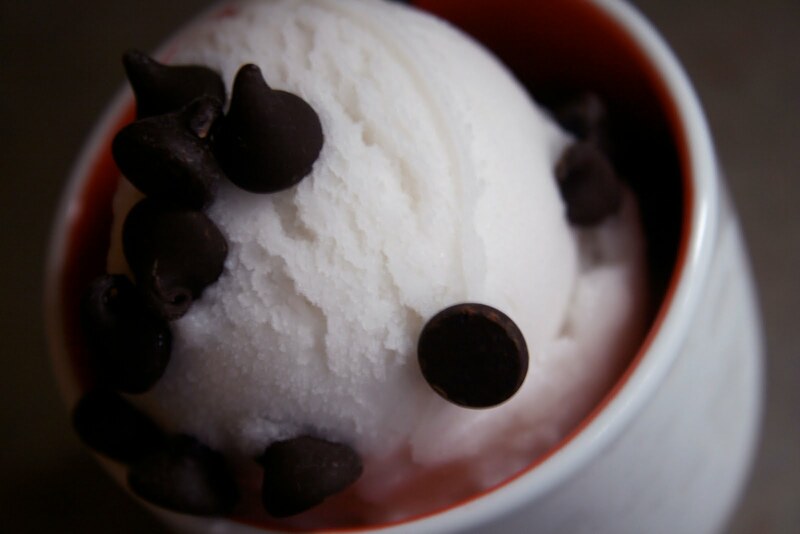 Food, Fitness, Community and Dairy Free Coconut Vanilla Sorbet! What is your relationship with food, fitness and community? I know this seems like a silly question, but I was wondering how that fits into others' lives. You see, for me, I have always done something physical. I was not then, nor am I now, an athlete in any way. I could not run to save my live. Everybody knows the Phoebe run from Friends...well that is what I feel like when I run only carrying 50 pounds extra. I think there is an art to running that I just don't have. I am totally envious of those who can though! I danced (mostly tap - yep the hat, the cane and feathers, some jazz and ballet only when I was really little) until I was in 10th grade. From 8th grade on I have exercised by myself. I don't know why, I just started doing it. I remember the first workouts I did were Gilad's Body's In Motion, Jane Fonda and yes...Cher. My workouts have changed a lot, but I still workout alone at home. Now, I am an interval training/kickboxing kind of girl. Funny that my workouts went from being prissy to being tough. I don't mind working out alone since it is what I have always done. I have found that I am better at it when I do it first thing in the morning. I prefer the peace of everyone else still being asleep. Today starts the first day of summer and things can get crazy around here. I thought about sleeping in, but decided it was best for me to just get up and get going! I have a friend that has a hard time finding a workout she likes. So, I suggested she start with 15 minutes of any kind of cardio and 15 minutes of any kind of muscle toning a few days a week. I think exercising is addicting and once you find something you like...you actually look forward to doing it! I have also found that the blogging community is very encouraging when it comes to goals and ideas for different types of exercising! Changing it up on a daily basis keeps it from getting boring! We have also been talking about food. I was the girl that thought fat free was the way to go for years! I have learned a lot since then! I am loving my healthy fats and finding new ways to incorporate them in EVERYTHING. It is so easy to get bored with food and not know how to make it more interesting. I am always looking at food and creating new recipes so sometimes it is hard for me to find a focus on what to make. I am always asking the illustrator what he is in the mood for. My friend and I went to the store the other day to shop for different foods. I really enjoyed sharing my ideas on food and how to change things up a bit! I introduced her to almond butter and quinoa...we now have another one on our side! Sometimes, when things get boring, just seeing someone put a new spin on an old idea...inspires you! 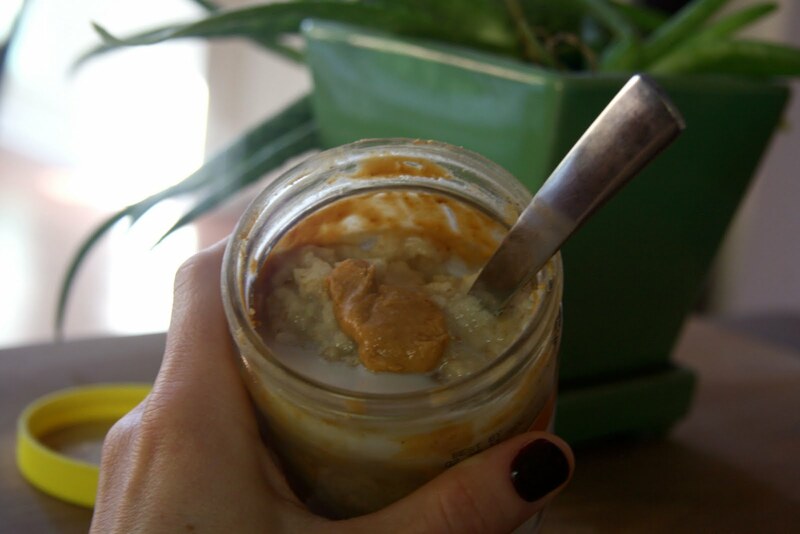 Seriously, oats in a peanut butter jar is complete brilliance! I think just putting food in pretty bowls or different containers makes it a little more fun! The peanut butter swirl gets all melty and gooey from the hot oats! I actually hide the "empty" jars in the fridge for occasions like this. The boys celebrated the first day of summer break with waffles...I had the OIAJ (oats, flax, peanut butter, cinnamon and almond milk)! I also like the blogging community because it gives me the ok to eat the way I like to eat! Most people I know think I eat weird. I can't help it...I like doing things differently! 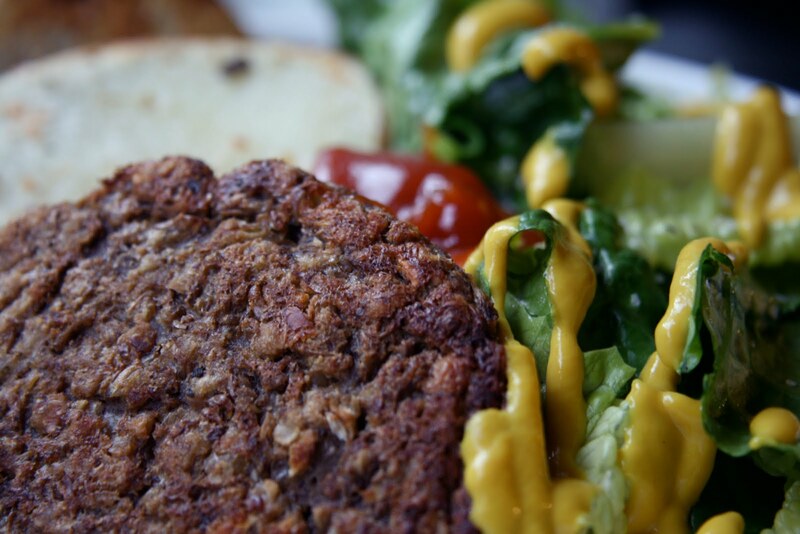 My favorite meal is bean burgers on a salad. Yesterday, I ate my last Lentil Quinoa Burger. So sad, but since they are so easy to make...I need to get on it! While most people eat french fries with there burgers...I love potato wedges on burger salads with mustard and ketchup, of course! I just take my baked potato, cut it in half, add a little kosher salt/fresh ground pepper and toast it up in a nonstick skillet. Oh and I can't forget dessert! I blame Evan for my ice cream cravings lately! 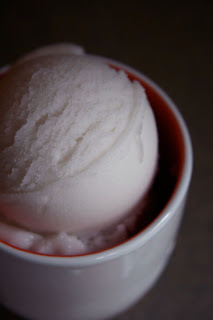 I bought some So Delicious Coconut Milk Beverage the other day and decided to make a Coconut Vanilla Sorbet. Some dairy free chocolate chips make it an extra special treat! This sorbet does not have a coconut flavor at all. It is very vanilla and so creamy (low fat and low sugar). Did you always exercise? What motivates you? Do your friends eat like you or do you do your own thing? I like this post! But first off, I feel it is my duty to ask you to post some epic Cher moves from the workout dvd.... thanks. And even if you don't like running (but let us first take a moment to appreciate all that is the Phoebe run...), it's awesome that you found your niche of what you do like! So many people do running just because it seems like a given, but don't ever enjoy it. Oh I used to adore Gilad!!! How funny. He's still around if you can believe that one. 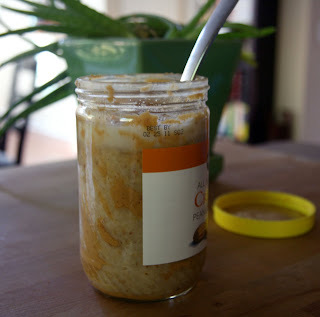 I still have not done the oats in the jar thing. 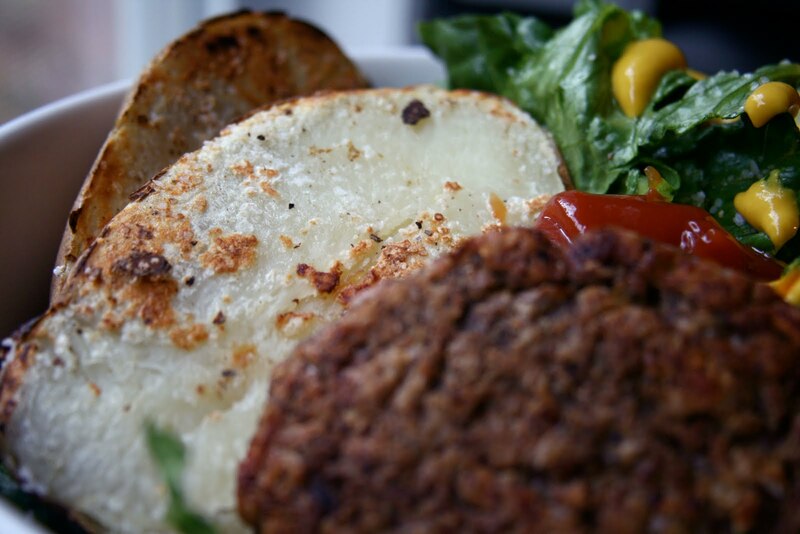 Funny you mention the lentil quinoa burgers. I have some quinioa leftover that I plan on making into burgers. I haven't decided which bean - black or lentil - yet...maybe both! Funny enough, I've never actually tried a So Delicious coconut beverage. I think I might have to now! I can relate to a lot in this post! I went through a low-fat/fat free phase too...because that used to be the norm for "healthy." My dry skin and crankiness would beg to differ! Vanilla Coconut Sorbet? I'm running to the fridge right now to grab my carton of vanilla So Delicious coconut milk beverage and make this! (So glad it's on sale now at Whole Foods. Sounds like I'll need to buy more.) Wait! NuNaturals vanilla stevia? Must find this NOW! I'm beginning to realize that the blogging community is very similar to the community I feel with WW. 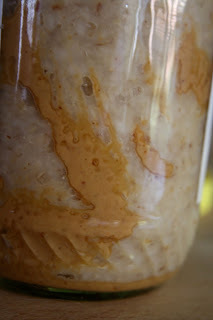 You've already converted me on many things (hello, almond butter! )...looks like you might be converting me to the blogger world next! Referred here from the Turtle Mountain Facebook Page... And I'm loving your recipe for the coconut sorbet! I've never been able to get into running, but my husband and I love our bicycles. Last year we splurged on a tandem cycle and put just shy of 2000 miles on it -- in addition to our individual bikes. We have great fun everywhere we go on it. I also blame Evan for my ice cream cravings too! I took a class on running technique, so now I'm super efficient, I just look like a perfect robot when I run. It's freaky in its own way. i love finding new ways to prepare food too. some weeks i fall into a rut but i love the days i feel inspired and find recipes or think up some creative ways to reinvent the wheel on veggies. i've always been on/off with exercise. but now i'm on and i plan to stay that way! I really want to make this coconut sorbet! but I dont have a special icecream maker or freezer. Is there any way to make a traditional freezer work? im the same way, i think the potatoes taste better that way!! You used to tap dance?! Me too! Isn't is fun? I am glad you found what you like to do today! I hate it when people run and then talk about how much they hate it. I feel like saying then find something YOU enjoy! That is the only way to make exercise lasting! omg the pheobe run!! hahaha I love that episode and love friends in general but I always think about that when I go running!! I also love the blogging community because its so great to see others who eat like me!! i have never tried the so delicious ice cream but i know its phenomenal!! I am jealous your boys are out of school, I still have 4 weeks to go! When do they go back? I used to eat fat free EVERYTHING also....I've been thinking a lot about that and how much I love pb and almond butter and olive oil right now. Funny how things change! I used to be a dancer too! I want to sign up for an adult ballet class so bad! the ice cream looks awesome!! but what i really love in this whole post, is your burgundy painted thumbnail. Classy meets not a boring mom. I LOVE IT! Great looking sorbet! I've been meaning to make some coconut milk popsicles lately....my local grocer has been out of coconut milk for over a week now-grrrr. i try to exercise every day, even if it's just 15 minutes here and there. My health motivates me-I want to stay strong!